Gone are the days when being a nerd is looked down upon. We don’t have to fear getting our shoes tied together, wedgies from the class bully or sitting alone at lunch. Instead, we can stand proud and loudly self-proclaim to be the marketing nerds that we are! Maybe you check Twitter and Google Analytics before breakfast (ahem) or maybe you optimize all of your emails, even ones written to friends. Or maybe you count lead scores instead of counting sheep when trying to fall asleep. Whatever your quirk is, stand from the rooftop and shout it out to the Twittersphere because the team at Lattice is ready to celebrate the geek chic movement. 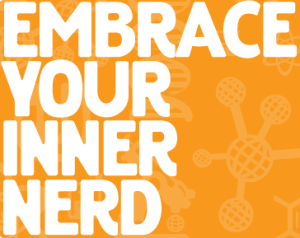 We want to hear why you are a #MKTGnerd. Join our conversation on Twitter and Instagram and let your nerd flag fly. In two weeks, we’ll select the best entries to win our essential marketing nerd survival kit. IN THE SPIRIT OF OUR #MKTGNERD CONTEST, I THOUGHT IT WOULD BE FUN TO LOOK AT SOME OF THE GREATEST MARKETING NERDS AROUND. Ann Handley (@marketingprofs)Both male and female marketers have publicly professed to have a nerd crush on Ann. She very well could be the queen bee of all marketing nerds. She’s chief content officer for MarketingProfsand speaker, author and industry veteran. Brian Whalley (@bwhalley)Brian, who leads up inbound marketing at startup Kinvey, is a growth hacker focusing on using technology to do new things and inventing new strategies that propel Kinvey’s inbound efforts to the next level. Christopher Penn (@cspenn)Christopher is the VP of marketing technology at PR firm, SHIFT communications. His blog offers insight into awaking your superhero with marketing, media and martial arts. Corey O’Loughlin (@coreyolo)Corey is known to get a little too excited about content and social. She’s part of the killer team over at MProfs and has been known to put hashtags on buttons and stickers. Craig Rosenberg (@funnelholic)When your moniker is based on the demand gen funnel, you are destined for marketing nerd-dom. Craig is a B2B marketing nerd focused on helping sales and marketing surpass their revenue goals. David Meerman Scott (@dmscott)As one of the foremost marketing thought leaders, he’s the author of hundreds of articles and eight books on marketing that have changed the way we market. David Raab (@draab)David is a long time marketing technology consultant and analyst. He knows the ins and outs of technology, metrics and measurement. He’s written THE guide to help marketers choose the right marketing automation platform. Joe Chernov (@jchernov)Joe is VP of marketing at Kinvey. He was CMI’s inaugural Content Marketing of the Year and surely one who geeks out over content, social, marketing automation and beyond. Lee Odden (@leeodden)Lee runs TopRank Online Marketing, one of the top SEO agencies around. He is at the center of the search, social and content intersection. Matt Heinz (@heinzmarketing)Matt is one of the great writers and speakers on the intersection of sales, marketing and demand gen. He is a big proponent of changing the demand funnel to a cloud or bowtie. Meagan Eisenberg (@meisenberg)Meagan is the VP of demand generation at DocuSign (disclosure: Lattice customer). She’s a self-proclaimed lover of marketing technology and marketing automation maven. Mike Volpe (@mvolpe)As CMO of Hubspot, Mike is a surefire marketing nerd. He lives and breathes inbound, content, testing and measurement, all in an agile style. Scott Brinker (@chiefmartec)Scott is CTO for ion interactive. He’s at the center of marketing technology, strategy, management and culture. And that equation equals marketing nerd. Sonia Simone (@soniasimone)Sonia is a founding partner at Copyblogger Media. She prides herself on her ‘once-weird’ marketing ideas to help all online marketers succeed. WE’D LOVE TO HEAR WHY YOU ARE A MARKETING NERD!